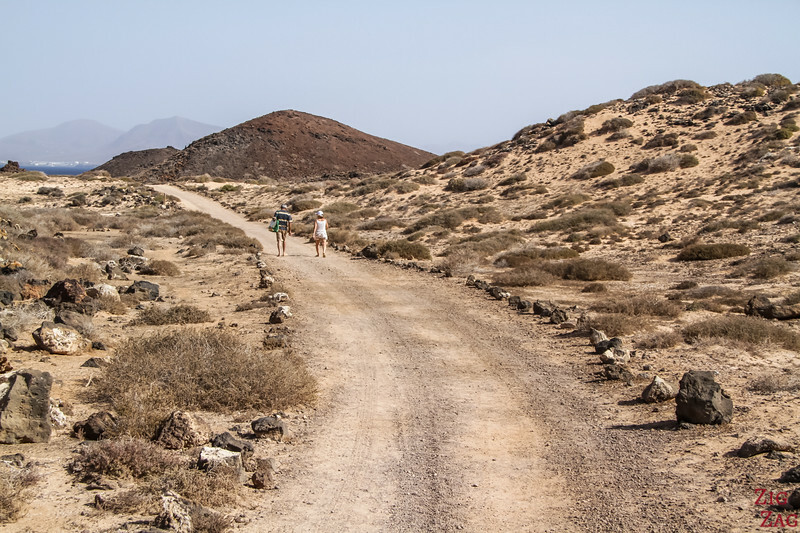 Lobos Island Fuerteventura is a fascinating place to explore. 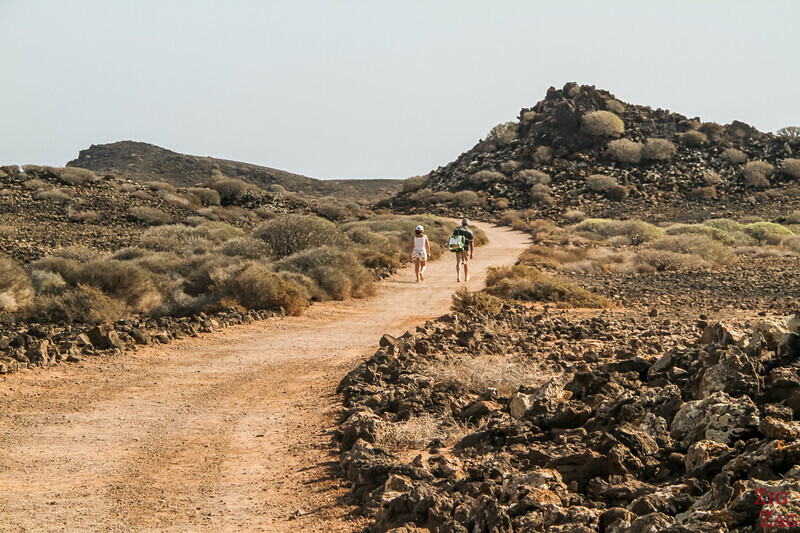 Located in the Canaries, just 2km North of its mother island, it offers wild beaches, lagoons and volcanic scenery. It makes for a great day trip. 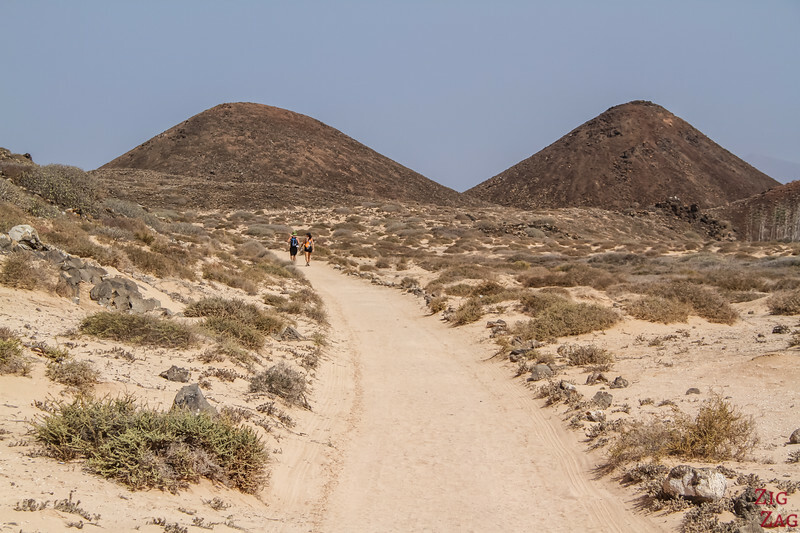 Let me show you around to one of the best things to do in Fuerteventura. Isn't it a fascinating place? 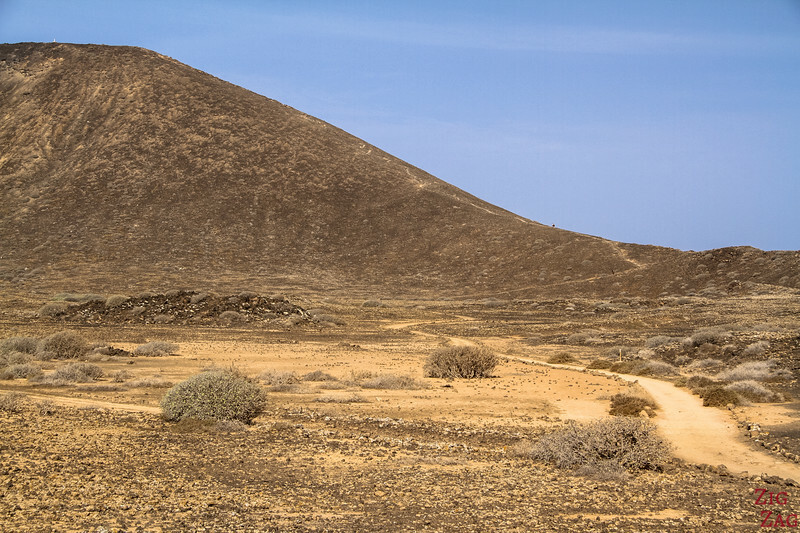 One of the best places to visit in Fuerteventura. 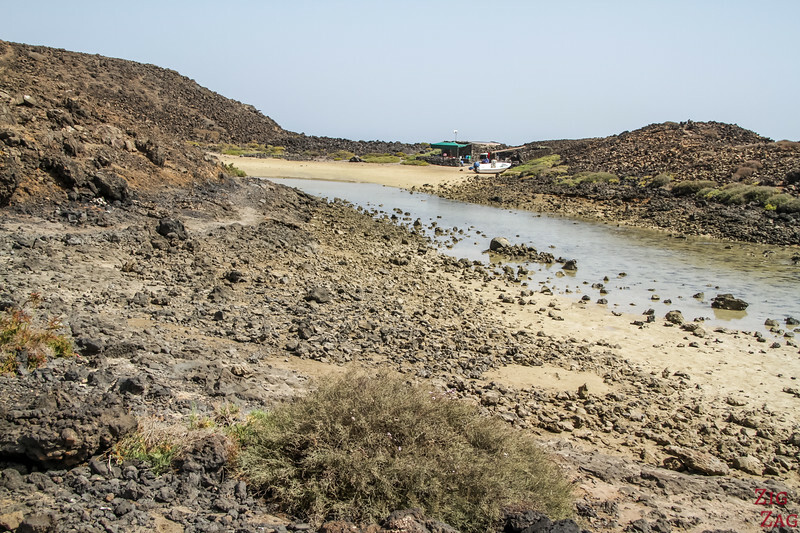 Lobos has a great variety of scenery with beaches, desert area, a caldera, a lagoon and a lake. 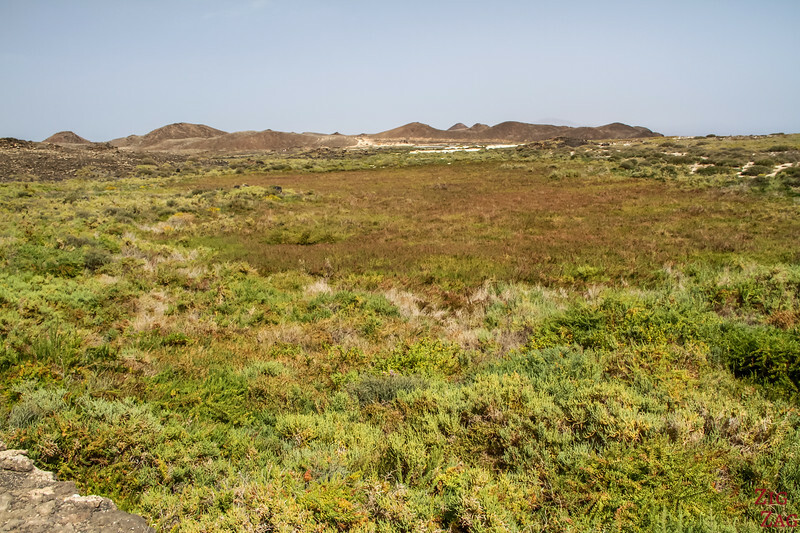 It is actually home to more than 130 species of plant and several birds. But for me the most fascinating were those round mounts of lava. They are called hornitos ("little oven"). They are created when lava comes into contact with water creating explosions. 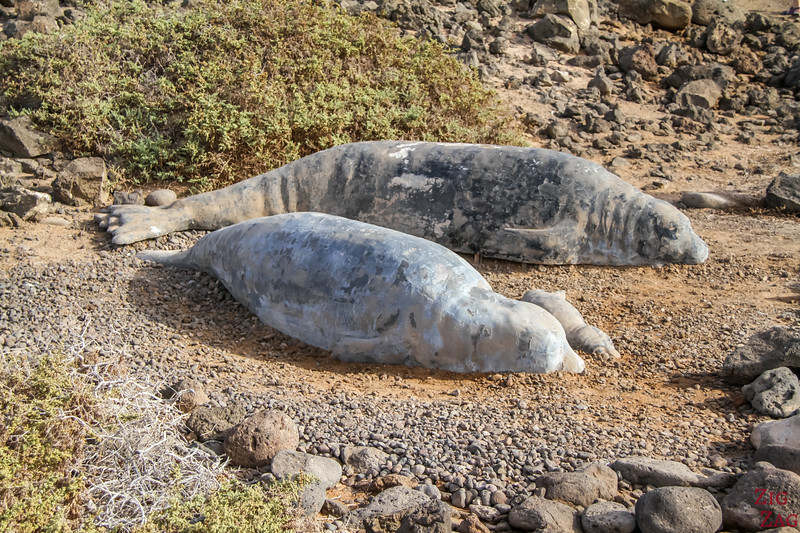 It comes from the large number of sea wolves that used to live on and around the island (monk seals). A colony had settled there when the island was 'discovered' by the Spanish conquerors in the 15th century. As you land on the island, near the wharf you can see a statue of the seals to remind us of where the name comes from. Sadly there are no more seals to be found, since they were hunted by the sailors and fishermen. So how to get to Lobos island? 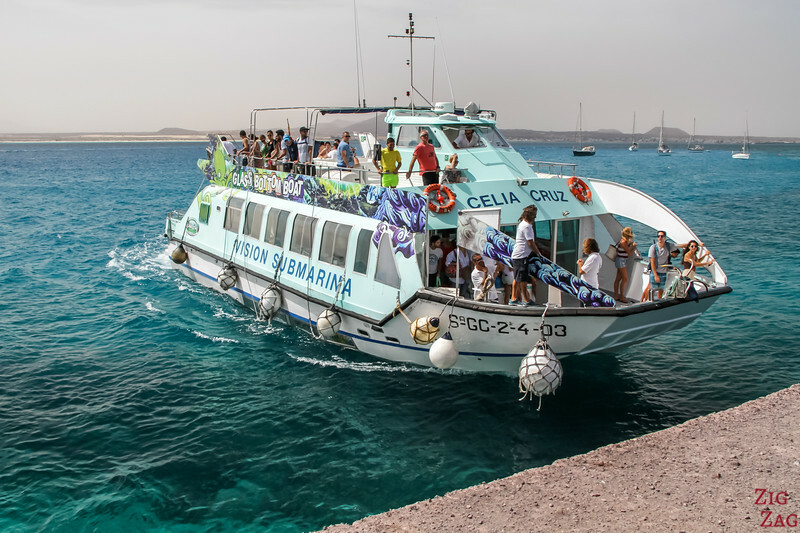 The easiest is from Fuerteventura of course, but you can find boat tours around the island from Lanzarote. 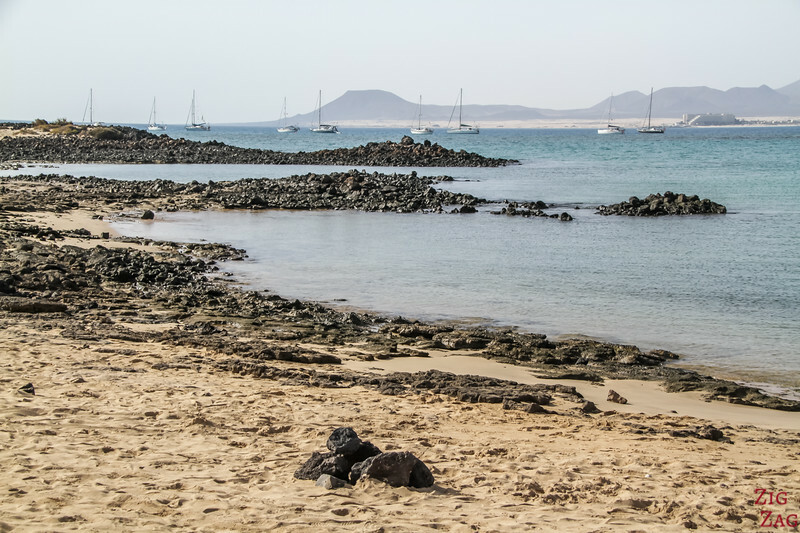 So first you need to take the ferry from Corralejo to Lobos. 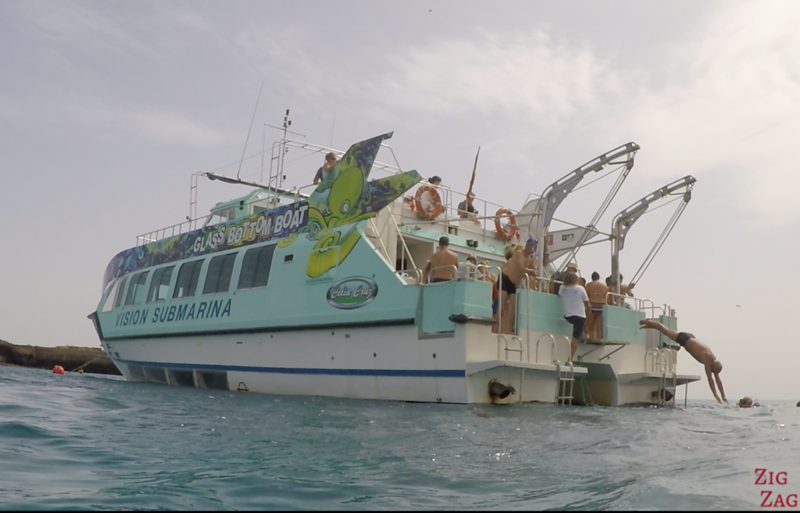 The boats are average size, quite comfortable with space inside and outside. 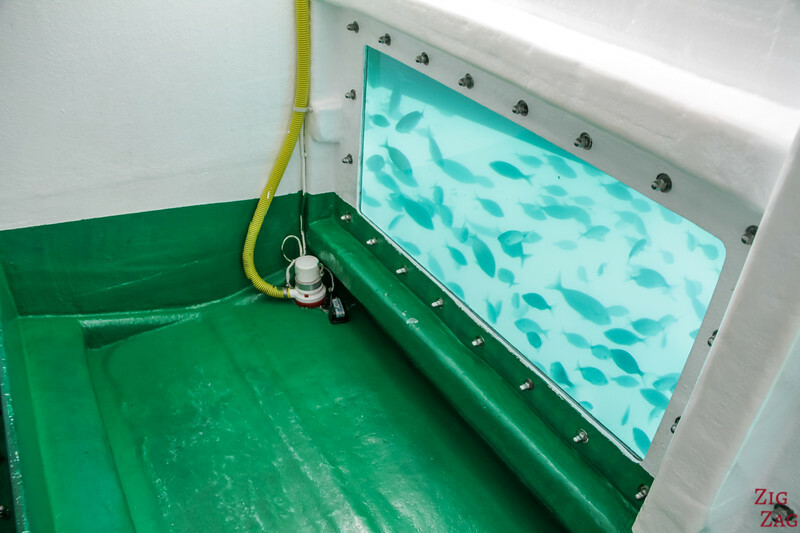 You can even go down to see the fishes underwater. 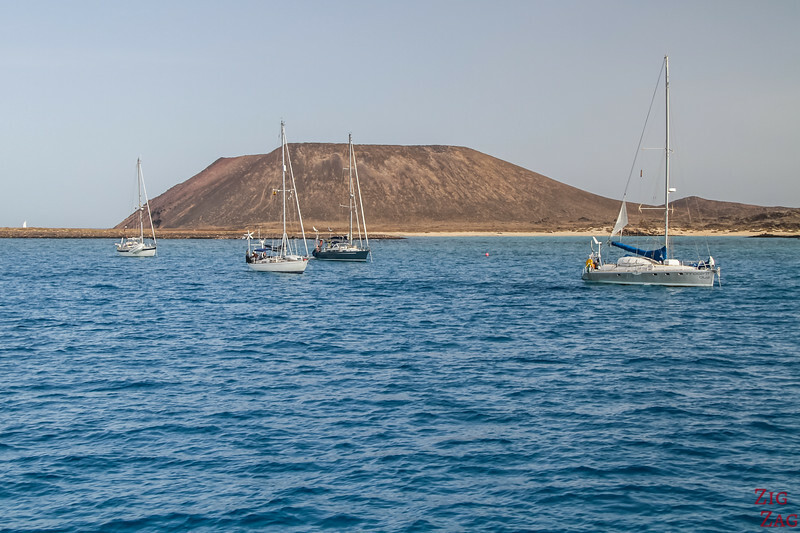 As you float away from Fuerteventura you can see the port town of Corralejo and the volcanic summit of Volcano Bayuyo behind it. You disembark on a wharf, so there are no difficulties. 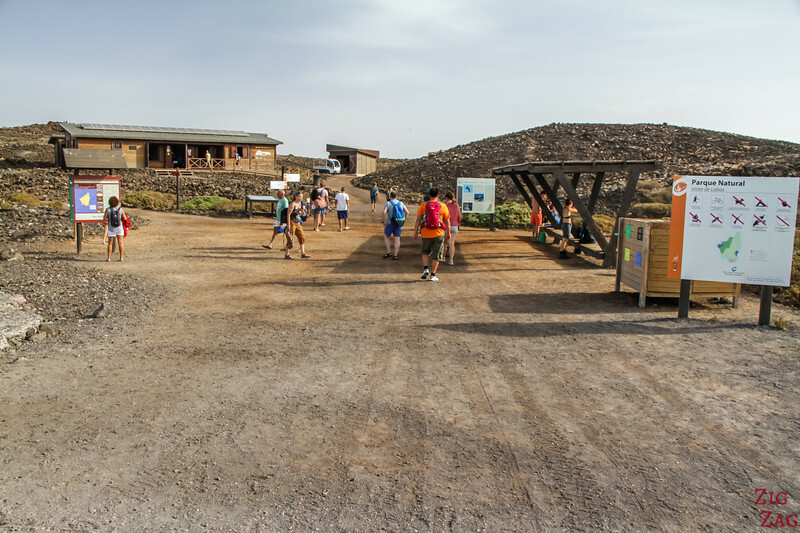 Near the wharf are some general information about the island, the bins and the visitor center. 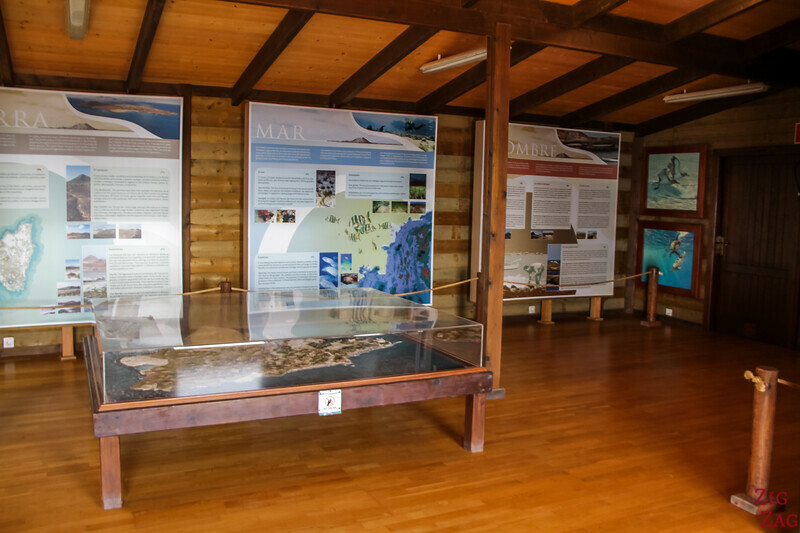 Inside you can find pictures and data about the Fauna and flora of the island. This is where you find the only toilets. 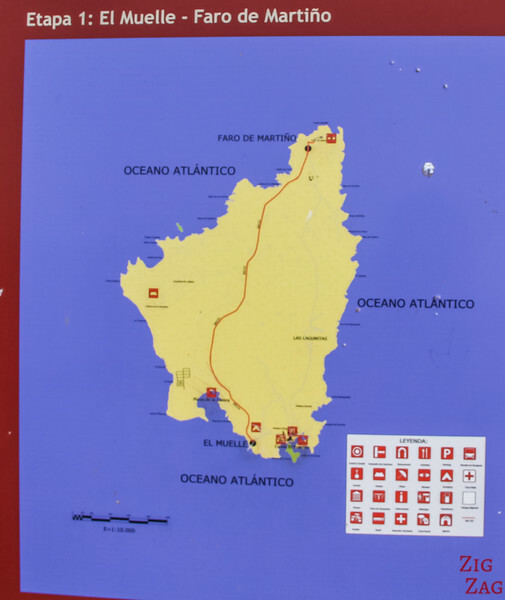 So right by the wharf you can find a map of Lobos island with the recommended tour. 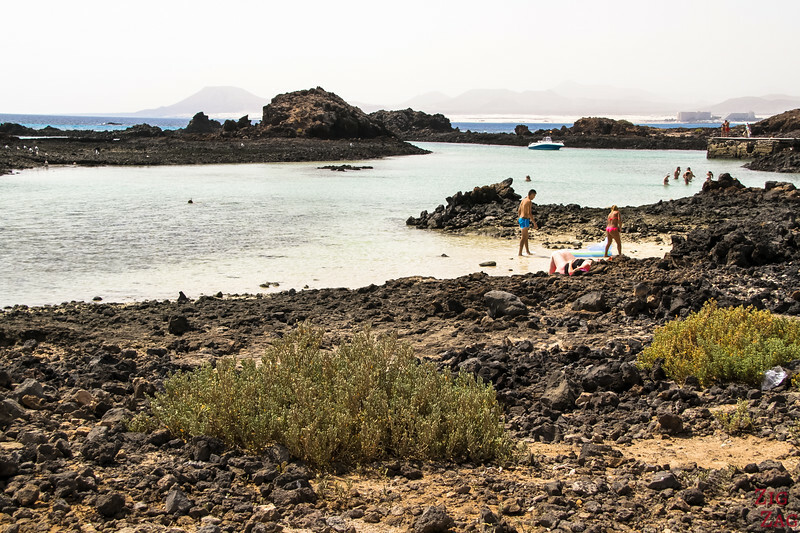 There are 2 types of visitors to the island - the ones that go to El Puertito to lay down and swim and those who want to explore. At different crossroads you can find signs indicating the direction of the various landmarks and how far they are. The paths are clear and you won't get lost. It is not allowed to go off the paths in order to preserve the fauna. Take plenty of water, sunscreen and a hat!!! 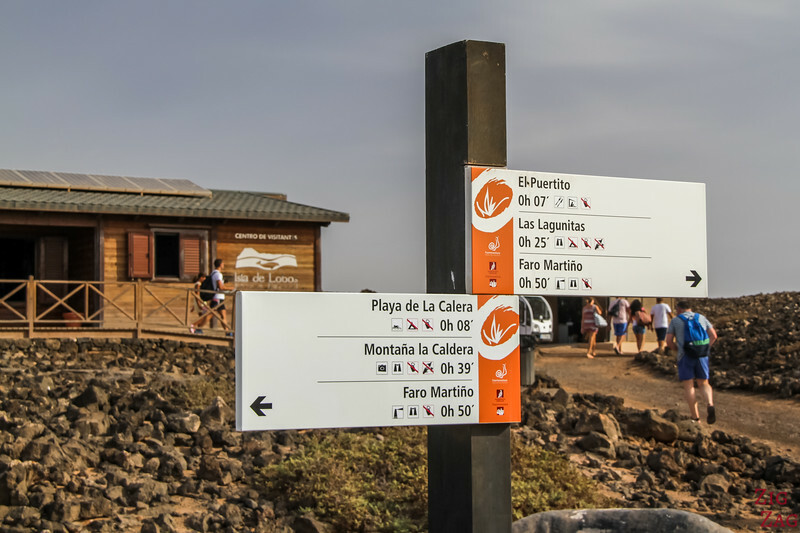 So the first stop only 10minutes away from the wharf on the left side is the beach called Playa de la Caldera. 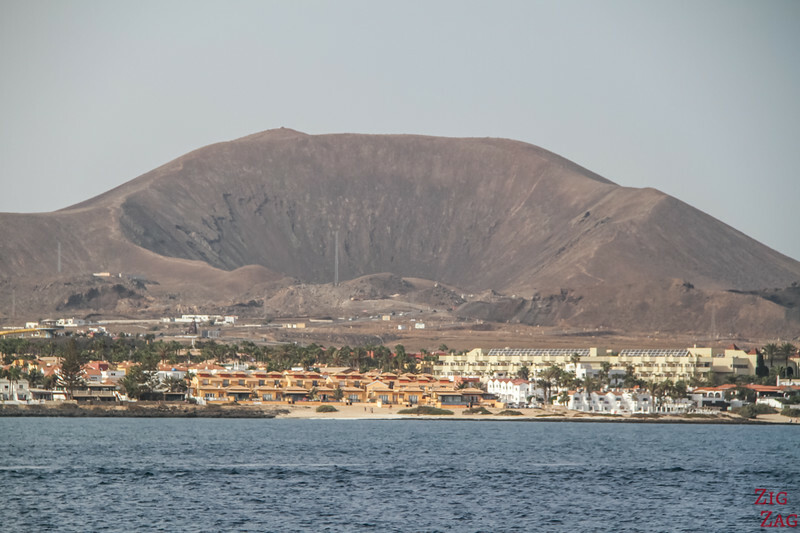 It is a beautiful round sandy area with the Montana La Caldera in the background. 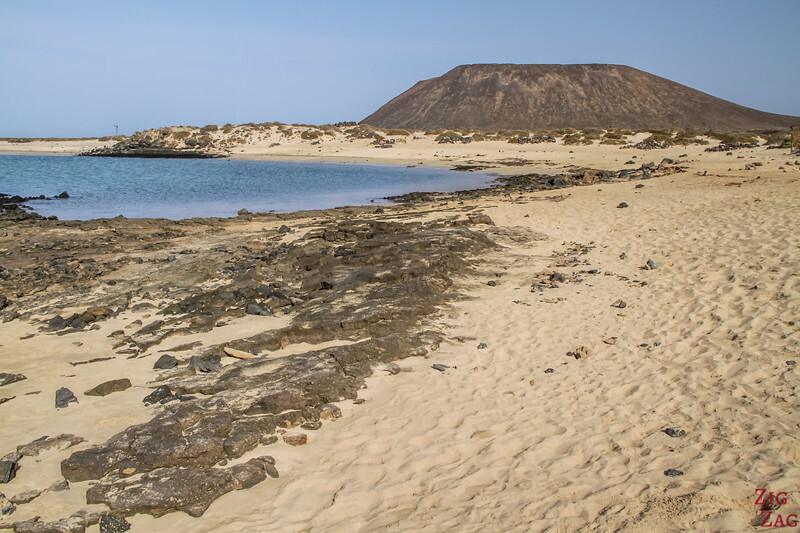 Playa de la Calera is the official name on the island but many sites (including Google maps) refer to is as La Concha Beach. 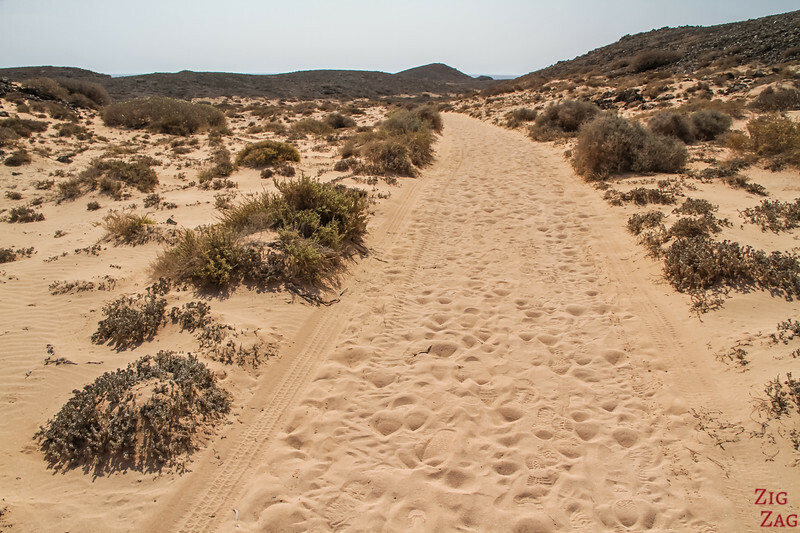 from what understand it is because there are rocks in the middle of the sand, so the first half is Calera and the rest is La Concha. 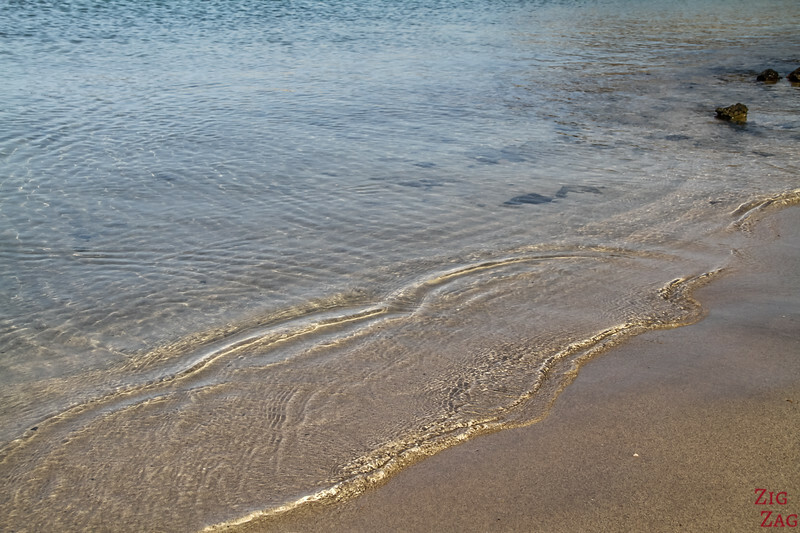 Because of its shape, it has calm beautiful water. A really nice place for those looking the spend the day at the beach. 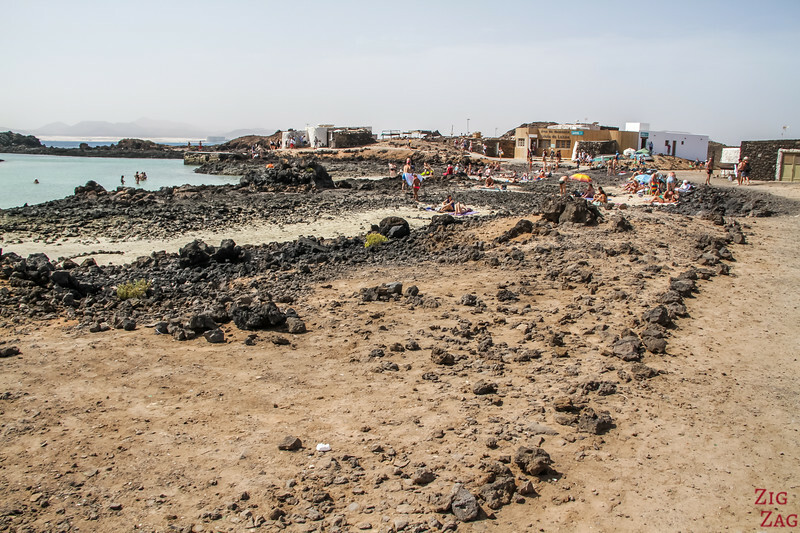 The sand is on most of the beach but you also have a lot of lava rocks. I love the contrasts in colours, don't you? 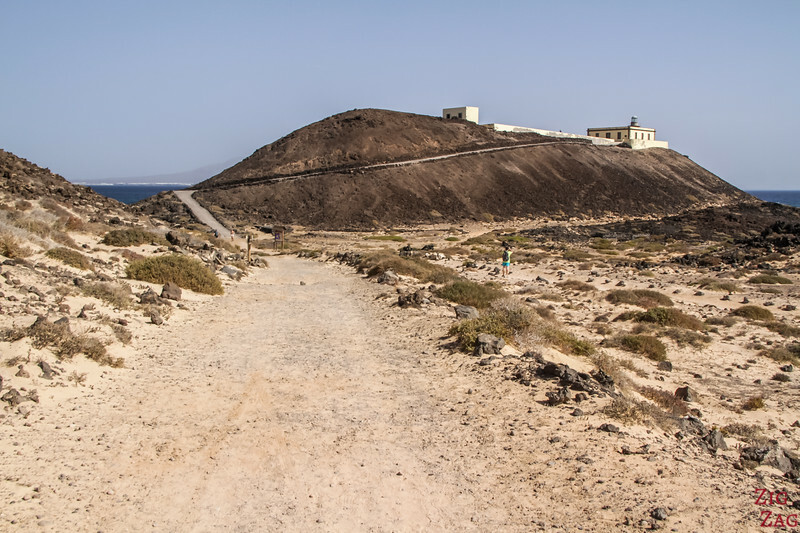 Next the path heads North towards the lighthouse and on the side is the biggest crater of the island Montana La caldera. It reaches 123m above sea level. 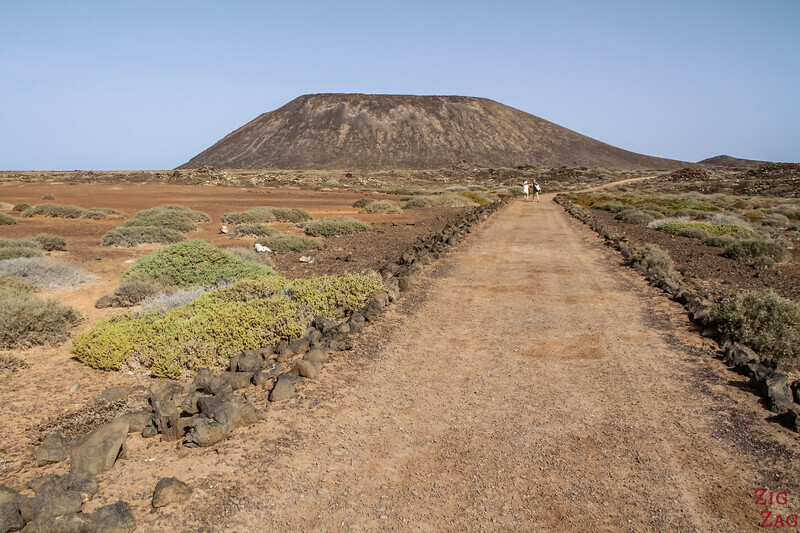 After a little while, you get the option to turn on a side path and start the climb of the volcano. It is indicated 30min to the top. The path is quite steep with some steps made or rock. With the harsh sun it can be difficult. 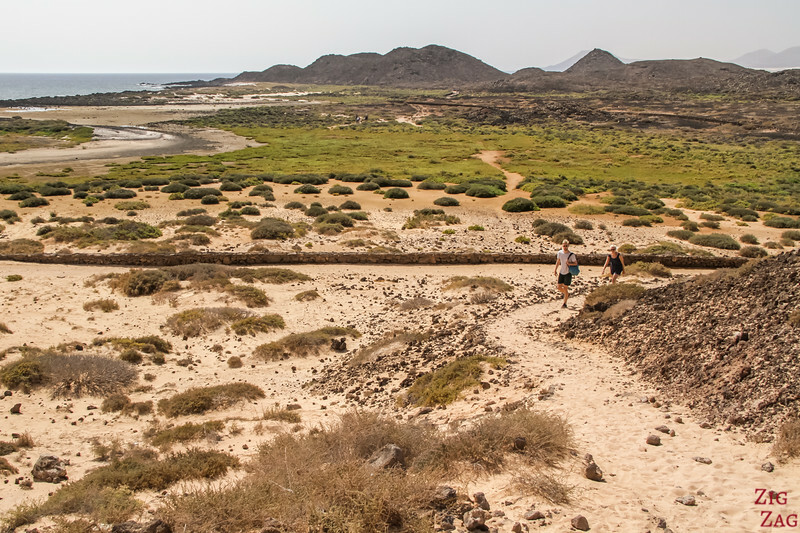 From there you have nice views of the island, of the beach and of Fuerteventura. 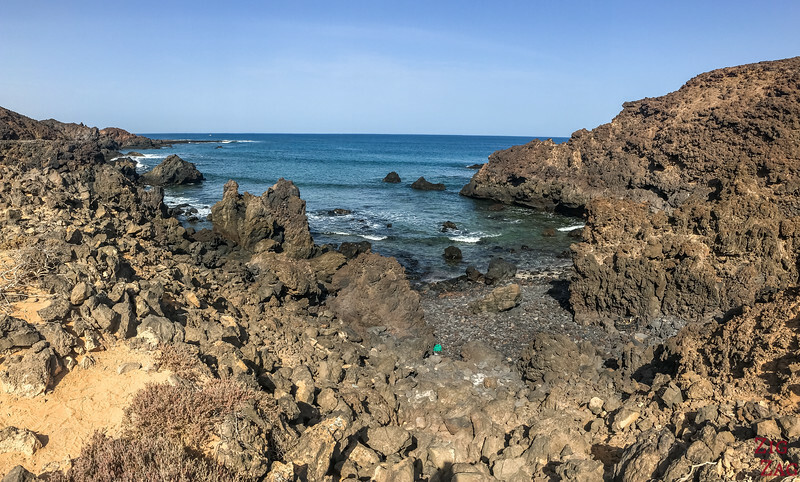 I opted to climb at the lighthouse at the other end of the island because it was easier and because it is not as high (so better to photograph the many lava rock mounts). So I have no photos to show you. But you can see a short video here. So the West path of the circular walk is really fascinating. 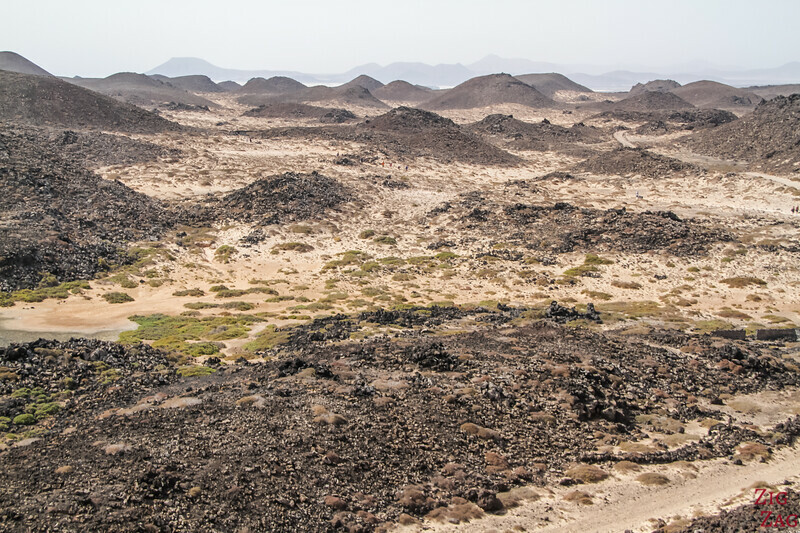 You are surrounded by this lava formation, desert landscape with small bushes. The sun is very hot!!! but the path on this side is quite easy as it is hard all the way. Towards the end, before the lighthouse, you get closer to water and you can see the fascinating cliffs created by the lava flow meeting the sea. Not as impressive as on La Graciosa or at Los Hervideros on Lanzarote, but still I love it. After a bit more than 1 hour, I reached the lighthouse. The climb is really easy and not too steep as you can see in the photo below. The lighthouse is still active and is automated. So nobody lives there anymore. 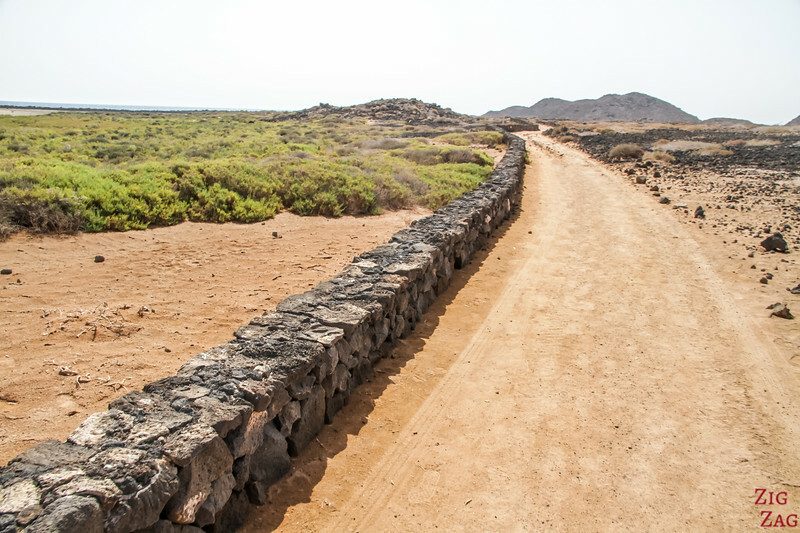 It date back to 1865 which makes it the oldest one in the Canary islands. 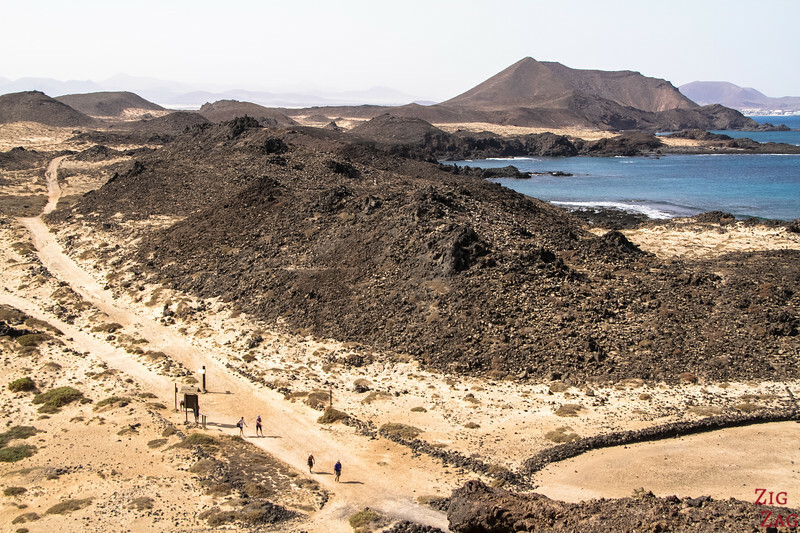 It marks the strait of La Bocayna between Lanzarote and Fuerteventura. I love the view you get from the top. 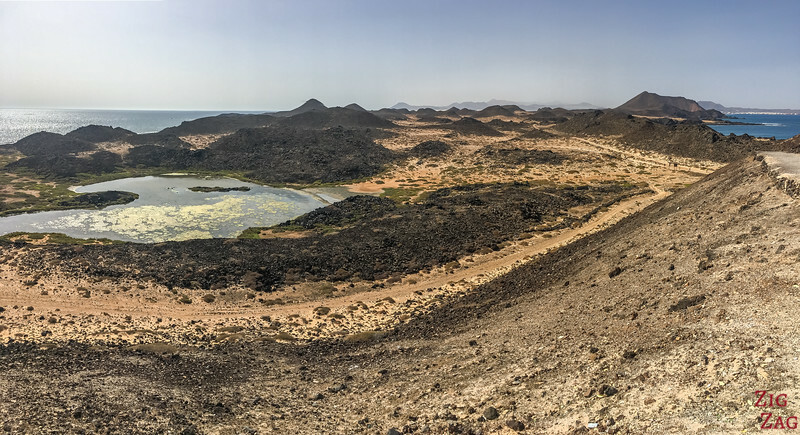 You can see the lake and all the little volcanic pyramids. It is quite fascinating. I came back via the East part of the loop. The beginning was difficult because it was covered with sand. And I am not good at walking in sand. But after a while it went back to a flat path. 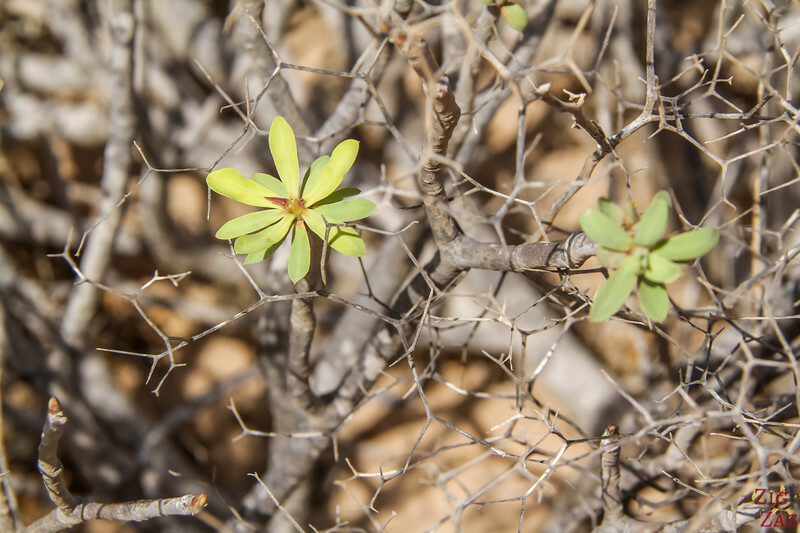 IT is quite amazing to see the plants are able to grow in this harsh landscape. 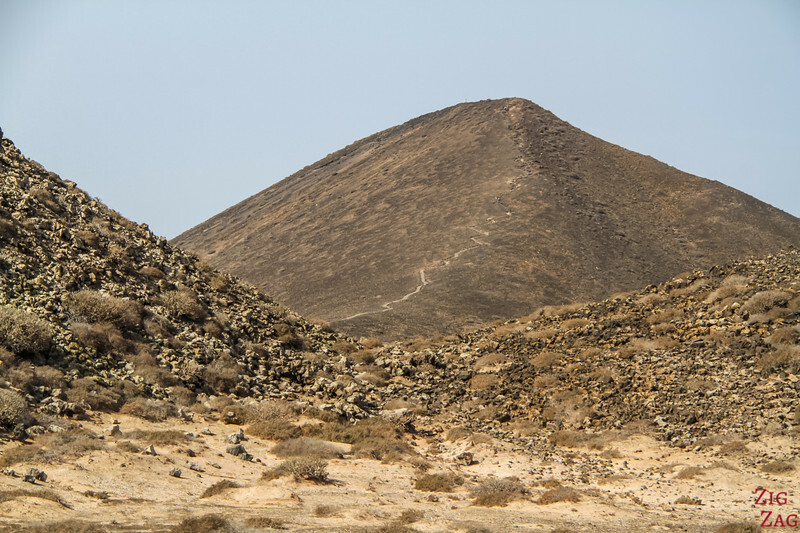 Some of the 'lava pyramids' are taller than other. YOU can see the scale in the picture below. After touring a harsh desertic land for more than 1h, it was surprising to discover this blanket of green right in the middle! You can find information about it at the viewpoint where this first picture is taken. It is a salt marsh called Las Lagunitas. It is subjected to regular floods during high tide which allow the presence of special fauna in the area. And it has created a feeding and resting area for migratory birds. However it is a every fragile environnement, so be respectful (not like some people I spotted) and don't enter the area. Stay on the path, it is already great to see from there. 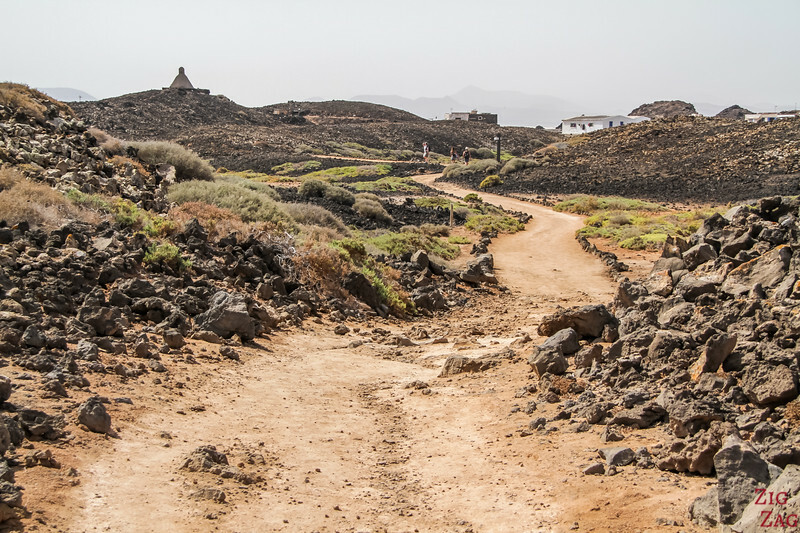 I finished my tour of the island with the small fishing village of El Puertito. Apart from the lighthouse this is the only place with houses. Those are weekend houses for local fishermen. However there is not much sand. 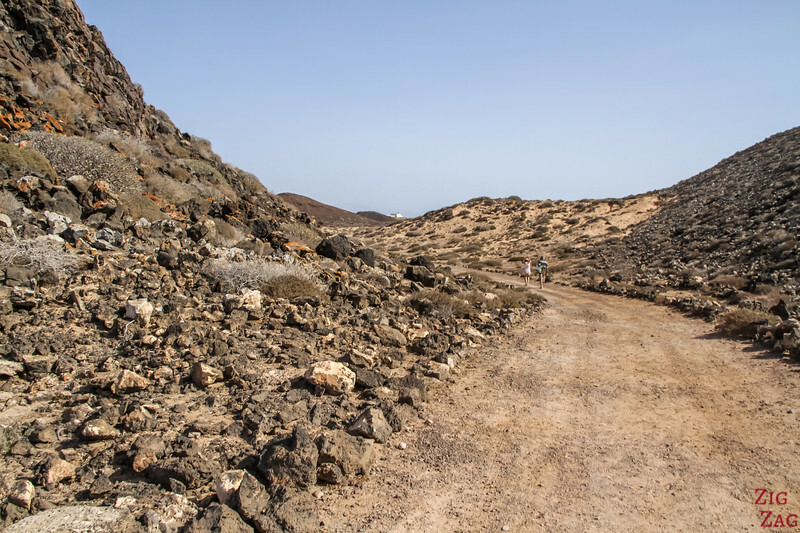 The whole area is shaped by volcanic rocks. 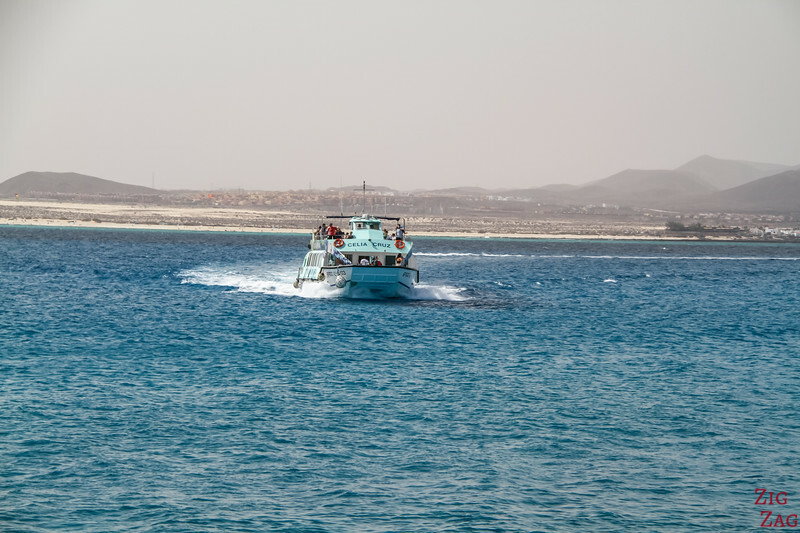 On the return trip on the ferry, when booking here, you can opt for the snorkeling return. 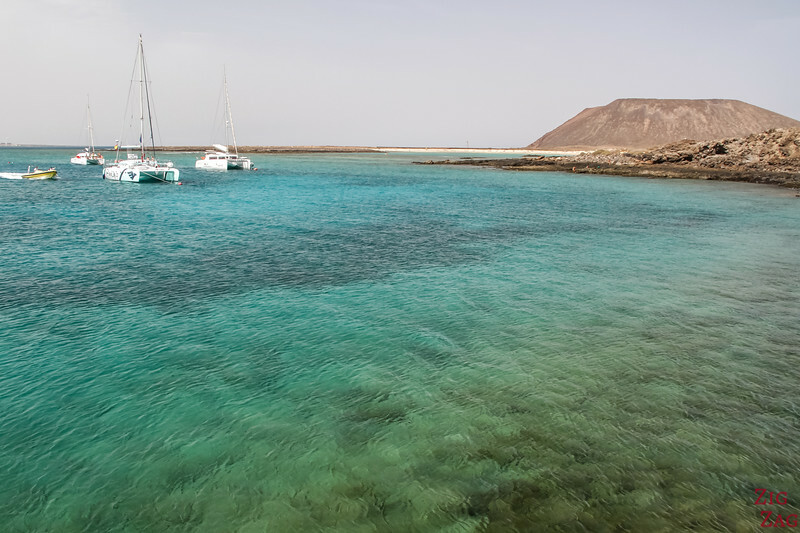 In that case, the boat enters one of the cove and you can jump in the water before getting back to Fuerteventura. 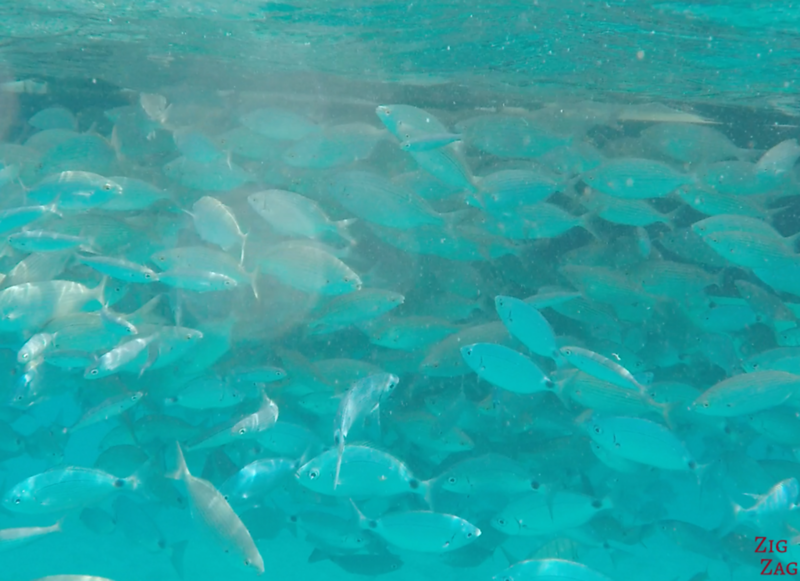 However I think that sadly they were dropping food to attract the fish so we could see a lot of them. But this is is great for sustainability. Unique island, don't you think?